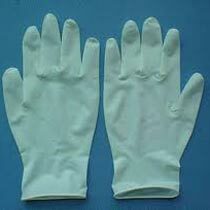 We bring forth the quality assured Latex Examination Gloves that is manufactured in the huge production unit. With the due assistance of professionals, we efficiently deliver the best in class Latex Examination Gloves. Non finger fatigue. Keeps the hands cool and comfortable. Manufactured as per ASTM-D 3578. Available in micro rough texture in Small, Medium and Large size. Available in dispenser box of 100 pcs. in Non- Sterile condition.